This article is about the lean manufacturing process. For the Kanban Method for services or software development, see Kanban (development). Kanban (看板) (signboard or billboard in Japanese) is a scheduling system for lean manufacturing and just-in-time manufacturing (JIT). Taiichi Ohno, an industrial engineer at Toyota, developed kanban to improve manufacturing efficiency. Kanban is one method to achieve JIT. The system takes its name from the cards that track production within a factory. For many in the automotive sector, kanban is known as the "Toyota nameplate system" and as such the term is not used by some other automakers. Kanban maintains inventory levels; a signal is sent to produce and deliver a new shipment as material is consumed. These signals are tracked through the replenishment cycle and bring extraordinary visibility to suppliers and buyers. Kanban became an effective tool to support running a production system as a whole, and an excellent way to promote improvement. Problem areas are highlighted by measuring lead time and cycle time of the full process and process steps. [clarification needed] One of the main benefits of kanban is to establish an upper limit to work in process inventory to avoid overcapacity. Other systems with similar effect are for example CONWIP. A systematic study of various configurations of kanban systems, of which CONWIP is an important special case, can be found in Tayur (1993), among other papers. The system originates from the simplest visual stock replenishment signaling system, an empty box. This was first developed in the UK Spitfire factories during the Second World War and was known as the “two bin system.” In the late 1940s, Toyota started studying supermarkets with the idea of applying shelf-stocking techniques to the factory floor. In a supermarket, customers generally retrieve what they need at the required time—no more, no less. Furthermore, the supermarket stocks only what it expects to sell in a given time, and customers take only what they need, because future supply is assured. This observation led Toyota to view a process as being a customer of one or more preceding processes and to view the preceding processes as a kind of store. Kanban aligns inventory levels with actual consumption. A signal tells a supplier to produce and deliver a new shipment when a material is consumed. This signal is tracked through the replenishment cycle, bringing visibility to the supplier, consumer, and buyer. A key indicator of the success of production scheduling based on demand, pushing, is the ability of the demand-forecast to create such a push. Kanban, by contrast, is part of an approach where the pull comes from demand and products are made to order. Re-supply or production is determined according to customer orders. In contexts where supply time is lengthy and demand is difficult to forecast, often, the best one can do is to respond quickly to observed demand. This situation is exactly what a kanban system accomplishes, in that it is used as a demand signal that immediately travels through the supply chain. This ensures that intermediate stock held in the supply chain are better managed, and are usually smaller. Where the supply response is not quick enough to meet actual demand fluctuations, thereby causing potential lost sales, a stock building may be deemed more appropriate and is achieved by placing more kanban in the system. Taiichi Ohno stated that to be effective, kanban must follow strict rules of use. Toyota, for example, has six simple rules, and close monitoring of these rules is a never-ending task, thereby ensuring that the kanban does what is required. Each process issues requests (kanban) to its suppliers when it consumes its supplies. Kanban cards are a key component of kanban and they signal the need to move materials within a production facility or to move materials from an outside supplier into the production facility. The kanban card is, in effect, a message that signals a depletion of product, parts, or inventory. When received, the kanban triggers replenishment of that product, part, or inventory. Consumption, therefore, drives demand for more production, and the kanban card signals demand for more product—so kanban cards help create a demand-driven system. In the last few years, systems sending kanban signals electronically have become more widespread. While this trend is leading to a reduction in the use of kanban cards in aggregate, it is still common in modern lean production facilities to find the use of kanban cards. In various software systems, kanban is used for signalling demand to suppliers through email notifications. When stock of a particular component is depleted by the quantity assigned on kanban card, a "kanban trigger" is created (which may be manual or automatic), a purchase order is released with predefined quantity for the supplier defined on the card, and the supplier is expected to dispatch material within a specified lead-time. An example of a simple kanban system implementation is a "three-bin system" for the supplied parts, where there is no in-house manufacturing. One bin is on the factory floor (the initial demand point), one bin is in the factory store (the inventory control point), and one bin is at the supplier. The bins usually have a removable card containing the product details and other relevant information, the classic kanban card. When the bin on the factory floor is empty (because the parts in it were used up in a manufacturing process), the empty bin and its kanban card are returned to the factory store (the inventory control point). The factory store replaces the empty bin on the factory floor with the full bin from the factory store, which also contains a kanban card. The factory store sends the empty bin with its kanban card to the supplier. The supplier's full product bin, with its kanban card, is delivered to the factory store; the supplier keeps the empty bin. This is the final step in the process. Thus, the process never runs out of product—and could be described as a closed loop, in that it provides the exact amount required, with only one spare bin so there is never oversupply. This 'spare' bin allows for uncertainties in supply, use, and transport in the inventory system. A good kanban system calculates just enough kanban cards for each product. Most factories that use kanban use the colored board system (heijunka box). Many manufacturers have implemented electronic kanban (sometimes referred to as e-kanban) systems. These help to eliminate common problems such as manual entry errors and lost cards. E-kanban systems can be integrated into enterprise resource planning (ERP) systems, enabling real-time demand signaling across the supply chain and improved visibility. Data pulled from E-kanban systems can be used to optimize inventory levels by better tracking supplier lead and replenishment times. E-kanban is a signaling system that uses a mix of technology to trigger the movement of materials within a manufacturing or production facility. Electronic Kanban differs from traditional kanban in using technology to replace traditional elements like kanban cards with barcodes and electronic messages like email or Electronic data interchange. A typical electronic kanban system marks inventory with barcodes, which workers scan at various stages of the manufacturing process to signal usage. The scans relay messages to internal/external stores to ensure the restocking of products. Electronic kanban often uses the internet as a method of routing messages to external suppliers and as a means to allow a real-time view of inventory, via a portal, throughout the supply chain. Organizations like the Ford Motor Company and Bombardier Aerospace have used electronic kanban systems to improve processes. Systems are now widespread from single solutions or bolt on modules to ERP systems. The Kanban philosophy and Task Boards are also used in Agile project management to coordinate tasks in project teams. An online demonstration can be seen in an Agile Simulator. ^ Waldner, Jean-Baptiste (September 1992). Principles of Computer-Integrated Manufacturing. London: John Wiley. pp. 128–132. ISBN 0-471-93450-X. ^ "Kanban". Random House Dictionary. Dictionary.com. 2011. Retrieved April 12, 2011. ^ Ohno, Taiichi (June 1988). Toyota Production System - beyond large-scale production. Productivity Press. p. 29. ISBN 0-915299-14-3. ^ Shingō, Shigeo (1989). A Study of the Toyota Production System from an Industrial Engineering Viewpoint. Productivity Press. p. 228. ISBN 0-915299-17-8. ^ Hopp, Wallace J. (Spring 2004). "To Pull or Not to Pull: What Is the Question?". Manufacturing & Service Operations Management: 133. ^ Tayur, Sridhar (1993). 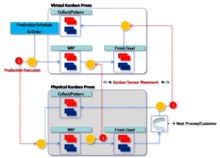 "Structural Properties and a Heuristic for Kanban-Controlled Serial Lines". Management Science. 39 (11): 1347–1368. doi:10.1287/mnsc.39.11.1347. ^ Muckstadt, John; Tayur, Sridhar (1995). "A comparison of alternative kanban control mechanisms. I. Background and structural results". IIE Transactions. 27 (2): 140–150. doi:10.1080/07408179508936726. ^ Muckstadt, John; Tayur, Sridhar (1995). "A comparison of alternative kanban control mechanisms. II. Experimental results". IIE Transactions. 27 (2): 151–161. doi:10.1080/07408179508936727. ^ Tayur, Sridhar (1992). "Properties of serial kanban systems". Queueing Systems. 12 (3–4): 297–318. doi:10.1007/BF01158805. ^ Schonberger, R.J. (2001). Let's Fix It! Overcoming the Crisis in Manufacturing. New York: Free Press. pp. 70–71. ^ Ohno, Taiichi (June 1988). Toyota Production - beyond large-scale production. Productivity Press. pp. 25–28. ISBN 0-915299-14-3. ^ Shingō, Shigeo (1989). A Study of the Toyota Production System from an Industrial Engineering Viewpoint. Productivity Press. p. 30. ISBN 0-915299-17-8. ^ Ohno, Taiichi (1988). Toyota Production System: Beyond Large-Scale Production. Productivity Press. p. 176. ISBN 9780915299140. ^ "Setting Up Kanban Management". JD Edwards EnterpriseOne Kanban Management 9.0 Implementation Guide. JD Edwards. Retrieved 26 February 2015. ^ Vernyi, Bruce; Vinas, Tonya (December 1, 2005). "Easing into E-Kanban". IndustryWeek. Archived from the original on March 16, 2006. Retrieved April 12, 2008. ^ Cutler, Thomas R. (September 2006). "Examining Lean Manufacturing Promise". SoftwareMag.com. Archived from the original on May 26, 2013. Retrieved January 29, 2013. ^ Lindberg, Per; Voss, Christopher A.; Blackmon, Kathryn L. (eds.). International Manufacturing Strategies: Context, Content and Change. ISBN 0-7923-8061-4. ^ Visual Tools: Collected Practices and Cases. Productivity Press. ISBN 1-56327-331-4. Waldner, Jean-Baptiste (1992). Principles of Computer-Integrated Manufacturing. John Wiley. ISBN 0-471-93450-X. Look up kanban in Wiktionary, the free dictionary. Wikimedia Commons has media related to Kanban.